The Maple Terrace Masonic Hall was chosen to hold the visit due to it being the oldest purpose built Masonic hall in the province of Northumberland as it was considered that brethren attending from Belgium and other constitutions as well as English provinces would appreciate the 19thcentury Masonic décor and in particular the East Window. Morden Lodge opened the meeting in due form and with solemn prayer at 2.03p.m. The Dispensation of the Provincial Grand Master, allowing the Additional meeting of Morden Lodge to take place, was read in open Lodge. The Worshipful Master, Bryan Conway, welcomed all the visiting Brethren who were attending the meeting, especially those from outside of our Province, which included brethren from Chevalier Ramsay lodge No.4 of the Regular Grand Lodge of Scotland, Minto Lodge, No.385 of the Grand Lodge of Scotland and East Goscote lodge, No2865 of the Prov. of Leicester. 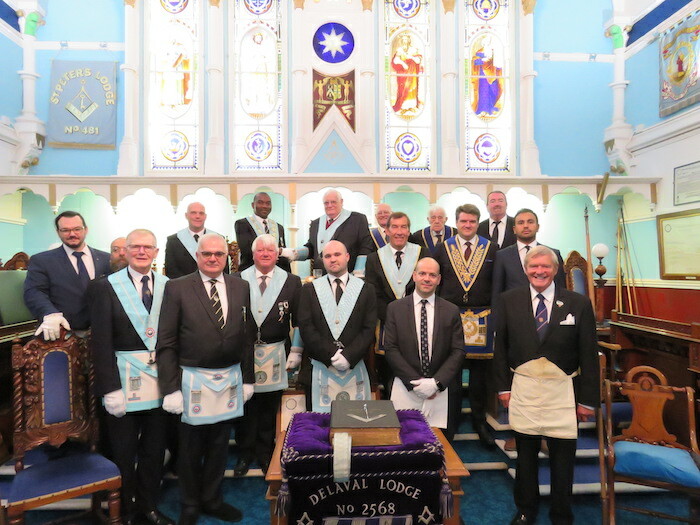 The Morden Lodge was then called off by the Worshipful Master and demonstration led by WBro Ernest Ban, Master, of Chevalier Ramsay Lodge, No.4, together with his officers was given of the First Degree, as conferred in the Regular Grand Lodge of Belgium, with WBro. Matthew Stephenson of Junior Warden of Morden Lodge acting as Candidate. Interesting aspects in the differences between Northumberland Past Masters the Chevalier Ramsay Lodg Ritual was the three Volumes of Sacred Law open on the pedestal, the extra work involved in the deacons duties and the fact that the candidate is seated in the North East Part of the Lodge and the lectures and charges are delivered to him there by the various officers and brethren involved. WBro Ban concluded the Demonstration and returned the Gavel to WBro Conway to great acclaim from the assembled Brethren. The Morden Lodge was then called on, The Worshipful Master Morden Lodge gave thanks to to WBro Ban and the Brethren of Chevalier Ramsay lodge for an excellent ceremony. The Brethren showed their appreciation with generous applause. Individual greetings were then given on behalf of 19 Lodges from 5 constitutions represented at the meeting. There were 64 brethren in total representing at least 5 different nationalities and 3 different faiths emphasising the universality and friendship of the order. The meeting was followed by a “Friendship Dinner” held at the County Hotel, Newcastle upon Tyne, to celebrate the event. As a number of brethren from Brussels had travelled with their wives the dinner was open to non masons and a total of 56 people attended including wives of brethren and gentlemen guests with their wives. Both Worshipful Masters gave short speeches of welcome to all of the attendees and emphasised the nature of the fraternity as possibly the only organisation which has as one of its main purposes the object to bring men together regardless of race, creed or colour. This was warmly appreciated by the audience as conveyed to both Masters when they toured the room speking to each individual guest to thank them for their support. During the evening Morden Lodge presented and Chevalier Ramsay Lodge with a framed drawing, by W.Bro Colin Gibson of Segedunum Lodge, of Morden Tower from which the lodge takes its name. On the back of the picture was a short history of the tower which is the only tower left on the walls of the city that is still in regular use. PrevPreviousAre you ready for Saturday 7 July?